Frosted Pineapple Cookies is the new cookie recipe I tried this year for a food blogger cookie exchange. These buttery cookies are made with canned pineapple and remind me of all of the good things you expect fruit cake to be. Growing up, it wasn’t Christmas until some lady in my family made some Hello Dolly cookies, the Chex mix was made with new wheat Chex, the peanut butter balls were dipped, and warm pecan sandies were coming out of the oven. So for me, the holidays are marked by those recipes. It was hard to resist the urge not to pull from one of those and to try something new. These cookies are buttery and sweet. They are almost tropical. I felt brave after watching a few of JoleneSugarbker’s channel on Youtube where she is baking up many fruity cookies. So I braved it and tried and adapted a new recipe. I swapped the shortening for butter, and add a few extras in the frosting. So here you go, frosted pineapple cookies. Susan from Mercerandsage.com who made some wonderful frosted lemon slice cookies. Laura from Ahealthyjalapeno.com who made some wonderful date pinwheel cookies. Fatima from Magnolia75thebakinglounge.com who made some oh so chocolatey double checker cookies. Links to all of those goodies to be posted soon. Frosted pineapple cookies have a wonderful tropical flavor. Drain pineapple reserving 3 tablespoons of juice. In a mixing bowl cream together butter and brown sugar until light and fluffy. Beat in egg, pineapple, and vanilla. In another bowl combine flour, baking powder, baking soda, and salt. Stir dry ingredients together. Gradually add dry ingredients to the creamed butter and sugar. Grease cookie sheet with non-stick spray. Drop cookies by cookie scoop onto baking sheet about 2 inches apart. These cookies will spread. Bake for 17 - 20 minutes or until golden. Remove to wire racks to cool. For frosting combine confectioners' sugar, lemon zest, and about 2 tablespoons of the pineapple juice to achieve spreading consistency. Frost cooked cookies. 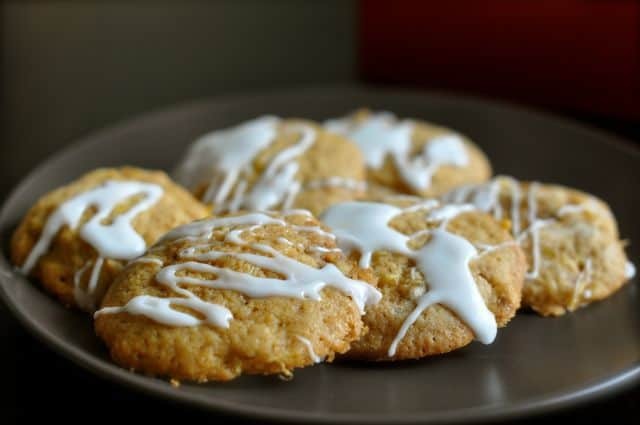 I have not made these yet, but I wanted to say in reply to the comment about there being too much pineapple juice in the crushed pineapple after being drained and the cookies went runny. Yesterday I made a pineapple cake and needed to get as much liquid as possible out a can of crushed pineapple. I drained and squeezed all the juice out….and was very surprised to realize that one can of crushed pineapple was about 60 percent liquid, the can yielded probably less than a cup of actual pineapple. I wasn’t going to try these cookies after reading the last comment, but now I think I will give them a try and not just drain the liquid, but also I will squeeze the heck out of it. I understand your reservations. You can watch my video, I didn’t squeeze out the pineapple, and I did not add additional flour. They were more wet than other cookies but they baked up very well. Caution- I’m an experienced baker- but just made these and am afraid I didn’t drain enough juice from the pineapple. The batter is way too wet. The cookies baked paper thin and obviously not right. Just added flour and remixed, so I’m going for the second batch now- fingers crossed! Shannon, I appreciate your suggestion. I have made these cookies this way several times. The dough is sticky, but baked up more cake like than a crisp cookie. To me it reminded me of a cake-like cookie. I hope you enjoyed your second batch.